"there is fact-driven brilliance in Bloodsport’s pages." There is a body of books on mergers and acquisitions (M&A). Among these are, of course, the iconic Barbarians at the Gate (though this title tells the tale of a single acquisition), a number of mostly nuts and bolts text books, and for the most casual reader there is even Mergers & Acquisitions for Dummies, a title that is a bit of an oxymoron as this is not a topic that lends itself to an oversimplified beach read. Tenured financial Journalist Robert Teitelman in Bloodsport manages to create a book that while at times veering toward the academic is entirely accessible. It is also surely the most comprehensive and insightful addition to the fully factual body of M&A books in print. Naturally, as in any fulsome telling, the well-known tabloid-worthy protagonists are here—Milken, Wasserstein, Rohaytyn, etc., as well as influential academics, lawyers, courts, and those who are known to many knowledgeable about M&A— though even most currently working on Wall Street in private equity will learn much about the many crosscurrents that influenced the evolution of corporate acquisitions whether by strategics (companies acquiring other businesses for strategic reasons), private equity, corporate raiders, and so forth. The book delves first into the conditions decades before the manic M&A activity in the 1980s that were essential to its development. While from here the book proceeds chronologically, there are frequent references to what has come before; the past at times continues to influence later events or enable us to better understand them. We also hear the echo of M&A errors noted earlier in the book, in part, to make utterly clear that these disasters of the past often fail to constrain repeated flawed M&A activity, underling the oft noted truism that the markets have short memories. Teitelman, covering decades, assembles a comprehensive history akin to a complex, deftly spun spider’s web of insightfully interconnected strands. Page by page, the author connects the many dots in his extraordinarily information-packed and also opinionated survey that easily grips any reader with an interest in the book’s topic. For current 24/7 on-call M&A professionals, this book, efficiently provides context for the conditions of the M&A world in which they operate. Of course, those in the game will turn the last page of the book, effortlessly shrug off unflattering conduct that parallels their own, but certainly move on at warp speed, efficiently edified, as they continue to chase the next deal, possibly better armed. An excellent return on time spent reading. This book merits inclusion in any business school finance curriculum. Students will be delighted by Teitelman’s telling and easily learn from it, not simply because of its authority, but because his voice refreshingly combines scholarly academic writing with clever turns of phrase and an engaging quick wit. What an excellent teaching resource. And for the rest of humanity, well, this is an excellent read for anyone who is interested in a true, level account of M&A history that never sensationalizes, is a reader ready to truly focus, and is one who enjoys a chuckle amid all the mad complexity. Sure, chicanery abounds, but not on every page. And when it does, Teitelman waxes ironic and writes with wit, but never falls off topic. Yes opinionated. Still, always factual. 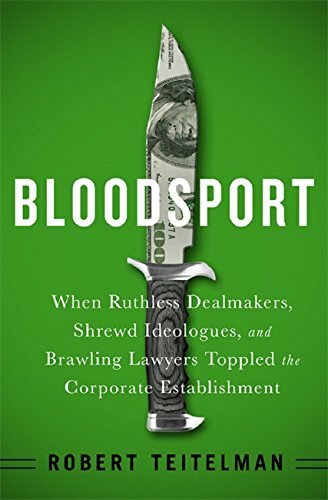 If the title of this book, Bloodsport: When Ruthless Dealmakers, Shrewd Ideologues, and Brawling Lawyers Toppled the Corporate Establishment, suggests a Michael Lewis read or more aptly a more current M&A book than Barbarians at the Gate, unfasten your seatbelt and reboot. No poetic license here. In the latter part of the book the author weighs in on Barbarians at the Gate and the “caricature” in its telling. His musings on this book shift over a series of pages. At first mention and after some discussion, Teitelman in sum correctly characterizes the famed title as a novelization. This is correct. There is thriller-like quality to this earlier book. And so we have the famed bestseller’s fact-based entertainment for the masses and a disciplined, journalist’s journalist recounting in Bloodsport. The two books sit easily side by side. Bloodsport is intensively researched and assertions are supported by the vast scope of material consulted as well as benefitting from the years of experience in financial journalism by one who gets it. There is no guessing about what is real and what is manipulated to create suspense. In short, there is fact-driven brilliance in Bloodsport’s pages. One minor missing element in this book is the market conditions that enabled private equity firms to profit in their leveraged buyout (LBO) takeovers of companies that could not be improved or even if they could, were trashed with debt raisings that enriched private equity executives and the institutional and high net worth investors in their funds. Often, after acquiring a company it became common practice in the second wave of LBOs and in later ones to date, to do second, third, etc. round debt financings, with all the proceeds paid as dividends to the private equity firm, and in turn to its investors in its funds. These proceeds at times resulted in quick returns that were a multiple of funds invested even if the acquired company ultimately filed for bankruptcy. No, as Teitelman points out, markets are not always efficient or rational. And while he doesn’t focus on the successive rounds of increasing debt, he portrays this nakedly greedy behavior that was not without casualties. After reading Bloodsport’s last page, we are left with the simple irony that despite a troubling legacy, short memories and greed often prevail in the market and that error has and likely will again repeat with implications and fallout that are yet to unfold. Ted Sturtz is the author of a well-received business book published in 2009 and the Editor-in-Chief of the New York Journal of Books.